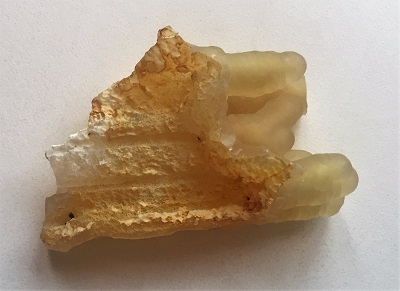 Natural pale golden yellow colored tube shaped Bamboo Agate specimen from Jawa Tengah, Java, Indonesia. 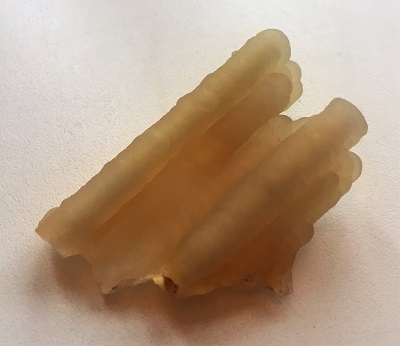 Natural pale golden yellow colored tube shaped Bamboo Agate specimen from Jawa Tengah, Java, Indonesia. Bamboo Agate is actually a stalactitic chalcedony that was created through a process called silicification; the bamboo plants covered by volcanic ash became fossilized when the organic matter of the plant was replaced with silica-iron rich ground water and hardened over time through pressure and temperature. 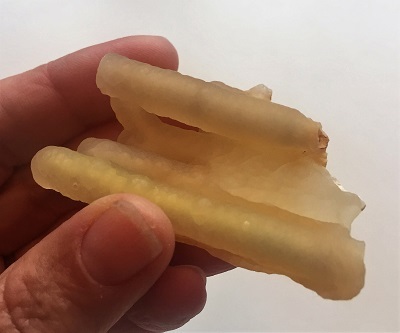 Bamboo Agate provides a pathway for receiving thought transmissions, telepathy and useful for balancing the energy of the body, mind, emotions and spirit. Bamboo Agate is a wonderful crystal tool encouraging a sense of community and enhances goodwill and generosity. The pale yellow color of the Bamboo Agate is invigorating and is uplifting for the emotions. Bamboo Agate has a nurturing and balancing energy alleviating hostility, irritability and melancholy. Bamboo Agate absorbs negative energy and dissipates it to prevent onward transmissions. 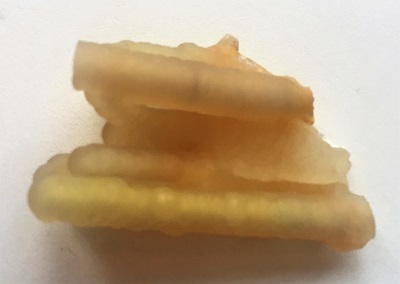 In healing, Bamboo Agate may be used to improve assimilation of minerals and to help combat build-up of materials in the veins. Bamboo Agate is said to cure varying forms of dementia, to rectify senility, to increase mental stability and physical energy. Bamboo Agate balances the physical body, as well as, the emotions, mind, and spirit. Bamboo Agate may be helpful in healing the eyes, gallbladder, bones, spleen, blood and circulatory system.